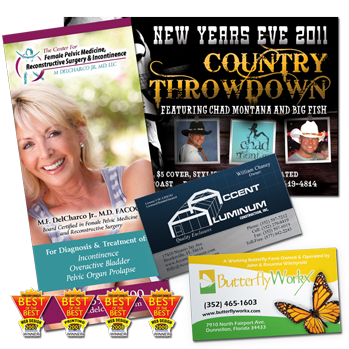 Printing - Postcards - Business Cards - Direct Mail - Citrus County Web Design - 29th Parallel Design - Award Winning Website Design, Printing and Graphic Design firm located in Inverness, Florida. Citrus County Website Design. Best of the Best Awards. Let us help bring your print materials to life. Whether you're in need of a simple postcard or a very complex multi-part mailer, 29th Parallel Design can help! Our team knows that a successful direct mail campaign is more than just a catchy design, it is an introduction of your business to a bevy of completely new potential clients that can completely transform your business. 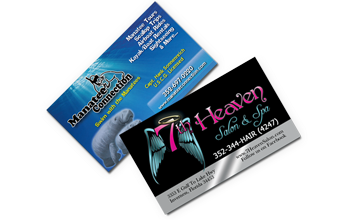 Whether you simply need a one-sided traditional business card or a newer double-sided modern design on plastic or paper, we can help! Let 29th Parallel Design help create you a memorable business card that potential and current clients will want to retain. It is easy to make mistakes on print jobs if you're not aware of the potential pitfalls. And with the many different options available these days, including; embossing, plastic coating, foil, metallic ink, etc., it's worth using a design firm that knows the subtle differences required for each option. Let us help guide you. Our website is a huge success. I receive compliments on it all of the time, mostly from complete strangers. On top of that it is a success in regard to our cabin rentals. Our business plan called for 33% occupancy. We have probably doubled that and sometimes more. Most of the business has come through the internet, people are impressed with the site and that is a big, big draw. I just wanted to share our success with you and thank you for helping us and doing such a wonderful job. OMG! What a GREAT artist - Miz Sara Heaton is the absolute BEST I've seen in many a Blue Moon! Love my new Back Porch Pickers business cards! Thank y'all so very very much, Sara! Great job! I LOVE them! 29th Parallel Design is a forward thinking and experienced advertising agency, specializing in website design, print media, direct-mail campaigns, graphic design and full-color printing. Copyright 29th Parallel Design & I.T., Inc. 2014. All Rights Reserved.